The creators aren't kidding when they say it's immersive—come prepared to move! in Wild Women of Planet Wongo. Photo by Russ Rowland. 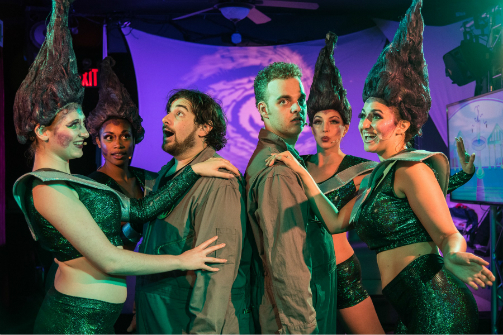 BOTTOM LINE: Sci-fi meets the groovy ’60s in this outer space musical about space travelers who land on a planet inhabited only by women. Science fiction comes in many forms, from the action-packed spectacles of Star Wars to the deep contemplation of Isaac Asimov’s short stories. Very few of these iterations, however, will top the over-the-top kitsch of ‘50s and ‘60s sci-fi films. These cheese-bombs were extraordinarily flawed and, in some cases, endearingly terrible. Both paying tribute to and poking fun at this special era are Ben Budick, Steve Mackes, and Dave Ogrin in their immersive sci-fi flower-power dance party musical Wild Women of Planet Wongo. When you first enter the audience each ticketholder is treated to a Wongotini, a green space-beverage that tastes like spiked gummy bears. The space is surrounded by television screens that show a revolving cycle of famous images of the 1960s, setting up the audience for the specific brand of entertainment we’re about to lose ourselves in for the next two hours. Once the story begins we are introduced to our space traveling heroes, the mostly reasonable Ric Rogers (Miki Hellerbach) and the dim-witted Louie LaFever (Howie Schaal). They suddenly crash onto a mysterious planet they’ve never seen before. Just when Louie begins to speculate/fantasize that this may be the mythical Planet Wongo, the two are suddenly surrounded by the never-before-seen Amazons who inhabit this all-female planet—the Wongettes. They greet the men with open arms and introduce them to Queen Rita (Amanda Nicholas), a proud matriarch who maintains control over any challenge presented to her (including her own emotions). The Wongettes invite Rick and Louie to stay on the planet for a while and enjoy the “wu-au” festivities later. Despite Ric’s initial insistence on repairing the ship and staying the course of their mission, Louie convinces him to accept the invitation. Little do they realize their hosts’ sinister intentions for the evening’s feast. Though Ric and Louie are the protagonists, the Wongettes and Queen Rita clearly run the show. The women often demand audience members move so they can occupy the space instead. During the two intermissions Sage Buchalter, who plays one of the Wongettes, forces the Wongo-Games upon unwitting audience members with attention-grabbing demand and sass. Though these characters also reflect the pervasive sexism of the times, the fact that their command and control is treated as a given is refreshing. I do wish this was played with a bit more—during some musical numbers the Wongettes are unnecessarily silly and fickle, especially during the scene when Queen Rita reads the three rules of procreation. That being said, Amanda Nicholas and the Wongette ensemble permeate so much energy and fun into the space you can’t help but join in. The story itself is corny and predictable at best, but if this is meant to pay homage to those early sci-fi films then Budick, Maches, and Ogrin have nailed it. Their music and lyrics provide the perfect mashup of kitsch meets catchy '60s tunes. And emphasis on catchy: my internal record player is still playing “Man Hunt” on repeat. What makes Wild Women of Planet Wongo truly unique, however, is David Rigano’s direction to make the experience naturally immersive. Audience members quickly snag what few seats are available, leaving the rest to stand and stare in envy. Yet moments after the story begins, everyone is standing up to see the action. Audiences are generally unpredictable—some enjoy participation, others would rather stand silently in the dark—so the fact that this creative team has made a show that has everyone moving with the performers is a special brand of incredible. Like the films it echoes, Wild Women of Planet Wongo has its faults. But, like the films, the entertainment lies in the pure fun of the experience. So if you’re a sci-fi junkie or you’re just looking for a casually fun time, grab a Wongotini and check out Wild Women of Planet Wongo. Wild Women of Planet Wongo is written by Ben Budick, Steve Mackes, and Dave Ogrin. Directed by David Rigano. Choreography by Justin Williams. Musical Direction by Paul Rigano. Video and Sound Design by Ido Levran. Animations by Rudy Agresta. Lighting Design by Lisa Hufnagel. Set Design and Props by Rob Dutiel. Costume Design by Elise Vanderkley. Makeup and Wig Design by Marsh Shugart. Production Supervisor and Stage Manager is Emily Grayson. The cast is Moriel Behar, Sage Buchalter, Aiesha Dukes, Miki Hellerbach, Mary Mondlock, Amanda Nicholas, Howie Shaal, and Sarah Summerwell.